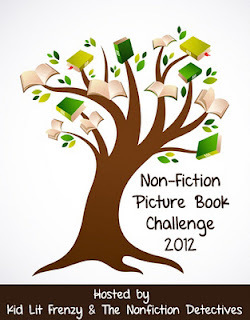 We have partnered with Alyson at Kid Lit Frenzy to encourage people to read more nonfiction picture books this year. Here's a new picture book biography that has made it to the top of my list of favorite books for 2012. I love introducing the readers in my library to people they don't know much about (Bessie Coleman, Jacques Cousteau, Charles Atlas, Annette Kellerman). I think it's safe to say that most children have probably never heard of Marcel Marceau. 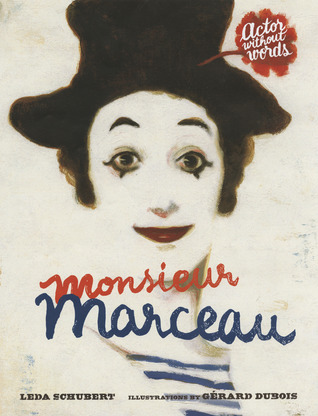 Leda Schubert masterfully introduces young readers to Marceau's work and the art of mime. In the beginning of the book, Schubert describes mime in a clear manner young readers will understand. his hands, his feet, his eyebrows, his toes"
As a teenager growing up in France, Marceau Mangrel was greatly impacted by World War II. Mangrel changed his name to Marceau to hide that he was Jewish. As a young man, Marceau helped groups of Jewish children escape from the Nazis by leading them over the border to Switzerland. His father later died in a concentration camp, and after the war Marceau took up mime. The author points out that the silence of mime reflects the silence of people who survived the Holocaust and were never able to talk about it. The story is poetic as Schubert uses the fewest words possible to convey the Marceau's work. When the narrative shifts from Marceau's childhood and teenage years to his work as a mime, the author shifts from past tense to present tense giving readers the sense they are watching him perform. with a rope that doesn't exist." The illustrations use muted colors that give the story a somber tone. Dubois intentionally leaves areas unpainted or with little paint creating a grainy texture which give readers a feeling they are reading about history. Later in the book, a black background provides a strong contrast to the white face and red lips of Marceau's character, Bip. An author's note provides readers with more insight into the life of Marceau, and Rob Mermin of Circus Smirkus advises readers how to try mime at home. Librarians, teachers and parents will want to read aloud this masterpiece to the children in their lives and introduce a new generation to an amazing artist. Visit the Macmillan site to view illustrations from the book.